If you have been injured in any kind of accident, whether it is an accident at work, a motorcycle accident, a slip trip or fall or any other type of accident then you could have a personal injury compensation claim that we could help you with. You can trust us to handle your accident injury claim in an honest and efficient manner, which is why we're the first choice for hundreds of accident victims every year. You are welcome to contact us even if you haven't made your mind up about claiming compensation for your accident. There is no obligation for you to proceed. These consultations may occur at our office, at a hospital or at your home depending on your condition and health. There is no obligation to commit at our free consultation meeting. We are pleased to meet with you free of charge. Contrary to popular belief, contingency fee agreements are allowed in Ontario. So what does this mean to you? Don't pay until your case settles! We understand that our clients have a hard enough time coping with the pain sustained in their accident; let alone having to go to work to earn a living. Many of our clients cannot return to work because of the pain and suffering they are experiencing as a result of their accident. Paying lawyers fees is the last thing on our clients' minds. We understand there are bills to pay, families to feed along with other fiscal responsibilities. This is why if the staff at Goldfinger Injury Lawyers accept your case, we will not ask for any money for our legal services until your case settles. We will be paid upon settlement of your case whereby we take a percentage of what we collect on your behalf. 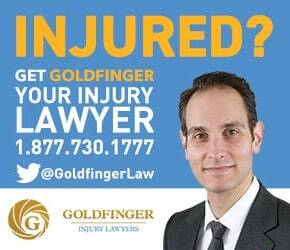 Contact Goldfinger Injury Lawyers for your free no obligation consultation today.